If there are no hard and fast parenting rules and we are all individuals with our own personalities and accepted ways of doing things, and if if internet forums are full of people disagreeing with each other then why on earth have Mumsnet published a book called The Mumsnet Rules? So what is the wisdom of crowds, how can there be any rules when everyone is sitting at their computers disagreeing with everyone else? The answer, we think, is this – that by reading a hundred different people’s views on controlled crying, on the contents of party bags, on how to help a child who has no friends, you find that there is usually a commonsense consensus around the important things. But there are also boundaries to what works and what is OK, and sometimes we need a (virtual) village to help us find those boundaries. The Mumsnet Rules maps out both the areas of consensus and the boundaries. Some areas of advice I completely agree with; such as keep your sick child at home, let them eat dirt and fall over, don’t hit them and turn off your lap top! A fab vbook , loads of fun to read and it makes you think! 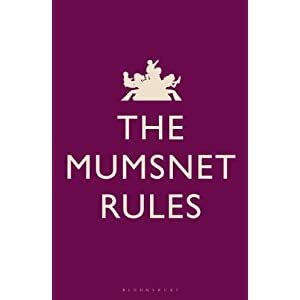 I have one copy of the Mumsnet Rules by Justine Roberts and Natasha Joffe (Bloomsbury :RRP: £12.99) to give away. It’s a great book, it will make you laugh, nod in recognition, agree, disagree and keep you thoroughly entertained. I learned a good few tips and tricks along the way too and there is a lot of wisdom here. To enter simply tell me you top bit of childcare advice! Previous Post The summer sales have started. Relax. The best you can do is the best you can do for them. Don’t compare your child, or yourself, against anyone else. Allow yourself to be silly. Think of your best childhood memories and create similar ones for your children. You may find country walks, splashing in puddles, home baking, art and craft, sharing a cuddle and a book are good ones; the best things in life are free! No use crying over spilt milk. I think that pretty much sums up living with kids. keep them entertained. A bored child is an annoying child! Not to follow any advice you’re not comfortable with. No one knows your baby like you do, not the Health Visitor, not the Midwife, not your in-laws….advice is advice, not the law! Yes, I agree- relax and enoy! They are small and lovely for a short period of time only. You choose to have your kids not the other way around so make sure they know every single day how much they are loved and appreciated and how lucky we are blessed with them in our lives. Always try and let them think it was their idea to do something and not yours! Listen to all the well meaning advice. Smile and nod, then make your own mind up. Don’t just say no; explaine things. Even young children can understand if you tell them that they can’t play with a knife as they might hurt themselves, or that we can’t do X today so why don’t we do Y instead ? We have avoided many a tantrum just by giving a reason for the answer. Pick your battles. It really doesn’t matter if you take your daughter to Sainsbury’s in wellies, a pink tutu, and her brother’s Batman cape – in fact you’ll make some new friends if you do. Go along with the fun things and your children will then do exactly what you tell them to do when it really is necessary – without argument. give them a choice. e.g are you going to eat the chicken or the carrots? It works much better by giving them a choice, helps them feel in control. Just follow your instincts. You will be given lots of advice but just pick the bits that are best for you. always be the parent first,the friendship will come later. Always be patient and have plenty of wild adventure stories to tell for these dull rainy days! When my first son was a baby an old lady once said to me ‘This particular baby has never been born before so why does everyone else think they know how to look after it?- Mum usually knows best- trust your gut instinct’ Boosted my confidence and I remember it from time to time. Follow your gut instinct – it’s very rarely wrong. Babies dont come out of the womb with an instruction manual so do what you feel is right and you won’t go far wrong. Do NOT take any notice of the remarks, tuts or negative looks when disciplining your children in public. Providing you are not swearing or using violence then no-one has the right to pass judgement. Your was is the right way! Concentrate on the tak in hand and not the opinions of those around you! Have patience, every question your child asks is just because they want to learn and that should be encouraged! Children need rules, routine and responsibility, so my advice is to give them all three. Athough most children will rebel and moan this is better for them in the long run. don’t hurry don’t worry and never forget to smell the roses ! let them know they are loved and have your support no matter what decisions they make, then be there to pick up the peices after! Have fun. They grow up too quickly. Get good memories that you can talk about!! my best tip is to listen to well meaning advice, say to the giver of the advice ‘yes you’re probably right’ then go ahead and do whatever feels right to you. I lost count of the times my well meaning mum & mum in law gave me completely opposite views. If I argued I just felt bad about it afterwards and if I tried to follow their advice and it didn’t work then I just felt a failure. A while ago I decided to agree with everything they said (to keep them sweet), thanked them for their advice and then went my own way. Afterwards I’d say to them, ‘that didn’t quite work but it made me think of trying…. instead’. Funnily enough, even when I’m doing my own thing the ‘mums’ think I’m doing what they suggested and everybody’s happy. Just love them, love them, love them, and treasure every moment, good and bad, because one day you’ll blink, and they”ll be all grown up with babies of their own, and you’ll wonder where the time went! My advice would be make the most of every second – they grow too fast! I like to have a ‘secret’ list of games and ideas for things to do…so that on those days when I’m tired and I just don’t know how we’re going to get through the day, I’ve got something fun to fall back on. I am a mum of 5,my main bit of childcare advice is to treat every child as an individual. What works for one child wont necessarily work for another. I compared my first 2 kids initially,it’s not fair though as every child does things differently and at their own pace.